Less than a month after being honored by GQ as its “Citizen of the Year,” Colin Kaepernick has earned another award for his work on social justice issues. Although the former San Francisco 49ers quarterback began his national anthem protests in 2016, he’s earned more recognition for them this season, even though he’s not currently in the league. Those protests have become a political flashpoint between President Donald Trump, athletes and progressive groups, with conservatives heavily opposed to the protests. Hector Villagra, executive director of the ACLU of Southern California, praised Kaepernick for taking a stand. 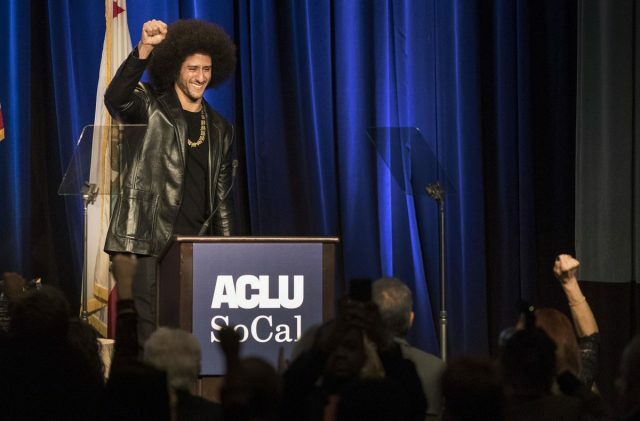 “We all have an obligation no matter the risk, and regardless of reward, to stand up for our fellow men and women who are being oppressed with the understanding that human rights cannot be compromised,” Kaepernick said in accepting the award. 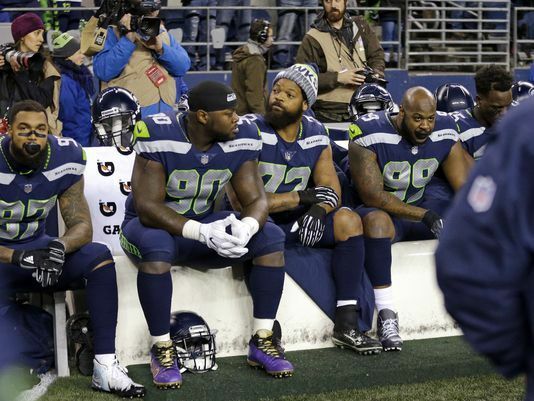 Seattle Seahawks’ Michael Bennett (72) sits on bench with teammates during the national anthem Dec. 3 before game against Philadelphia Eagles. The Seahawks trounced the Eagles. Free-agent quarterback Colin Kaepernick was announced Monday as one of 10 candidates for TIME’s Person of the Year for 2017. Trump was recognized by the magazine in 2016, and German chancellor Angela Merkel was its 2015 recipient. TIME will announce its latest “Person of the Year” on Wednesday. Kaepernick was the first NFL player to take a knee during the national anthem last year, describing it as a means of protesting police brutality and racial inequality in the United States. He became a free agent in March and has yet to sign with an NFL team this season, prompting him to file a collusion grievance against NFL owners. </Kaepernick’s initial protests have sparked a wave of related demonstrations — particularly after Trump in September used an expletive to describe those who kneel during the anthem. Dozens of NFL players have either taken a knee, sat on the bench, raised a fist or otherwise protested before games this season. TheAssociated Press reported that 18 players demonstrated in some form or fashion during The Star-Spangled Banner on Sunday. The protests have continued to draw the ire of Trump, who views them as unpatriotic and disrespectful to the military. He most recently called the NFL “weak and out of control” on Twitter in response to the continued demonstrations. Kaepernick made a rare public appearance at an ACLU event Sunday and is expected to be in New York on Tuesday night to accept an award from Sports Illustrated. This entry was posted in Uncategorized and tagged FreeCharlesLewis, https, MeToo, TAKEAKNEEFORCRIMINALINJUSTICES. Bookmark the permalink.